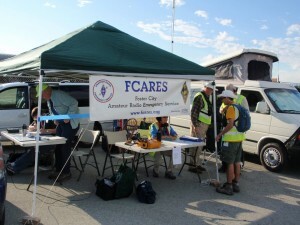 The principal mission of the Foster City Amateur Radio Emergency Services (FCARES) group is to provide emergency communication for the community of Foster City, California. ARES is the Amateur Radio Emergency Service organized by the ARRL. ARES members are licensed amateur radio operators that volunteer their time and equipment to help when normal communications fail or become inadequate. Any amateur radio operator can participate in ARES and ARRL membership is not required. The possession of emergency-powered equipment is desirable, but is not a requirement for membership. Copyright ©2009-2018 Foster City Amateur Radio Emergency Service, Inc.
All Rights Reserved. | ARES and "Amateur Radio Emergency Service" are a registered trademarks of the American Radio Relay League (ARRL).